For the third time in New College history, beehives will occupy our campus. 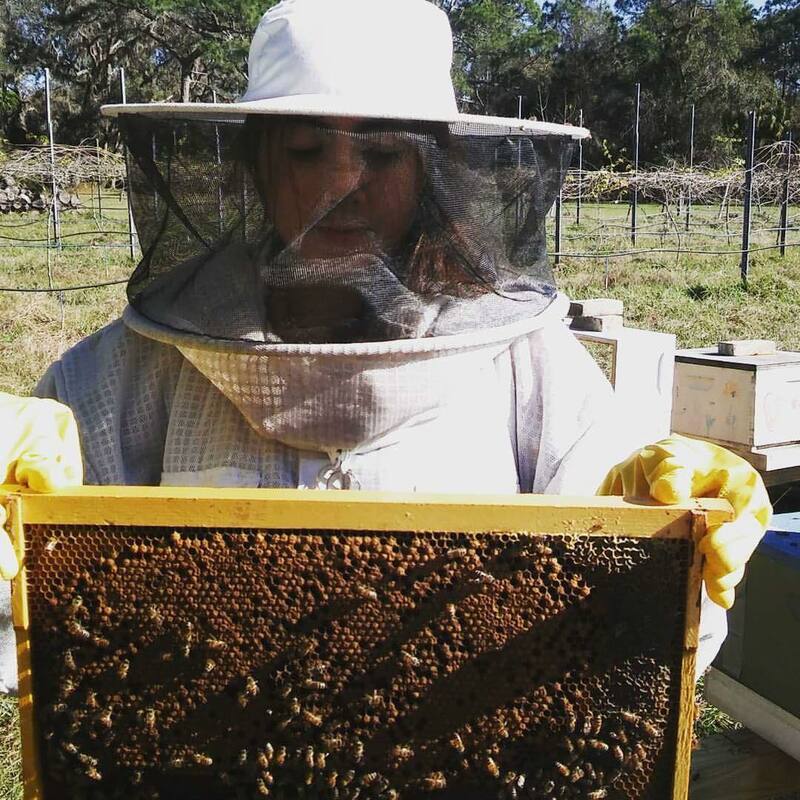 The college is participating in the Sarasota Honey Company’s Host-A-Hive Program, in which Owner and Head Beekeeper Alma Johnson will manage and maintain the hives while the bees pollinate the college’s food forest and produce honey to be provided to the Four Winds Cafe. Johnson will also offer engaged students the opportunity to work with her and the hives hands-on, passing on her skills as a professional apiarist. Learning from mistakes of the past, current students intend to create a long-lasting partnership, structure and space for honeybees to thrive on campus. Second-year Environmental Studies student Lili Benitez has spearheaded the initiative to bring beehives back to New College. Since the early 1990s, New College has accommodated two separate beehive endeavors. The first apiary was created with the help of Professor Emeritus of Psychology Gordon Bauer. One of his students, Sabrina Burmeister, was particularly interested in researching the behavior of honeybees. “She had expressed an interest in studying learning and memory in honeybees, […] so we got some space on campus and we set up a laboratory,” Bauer said. 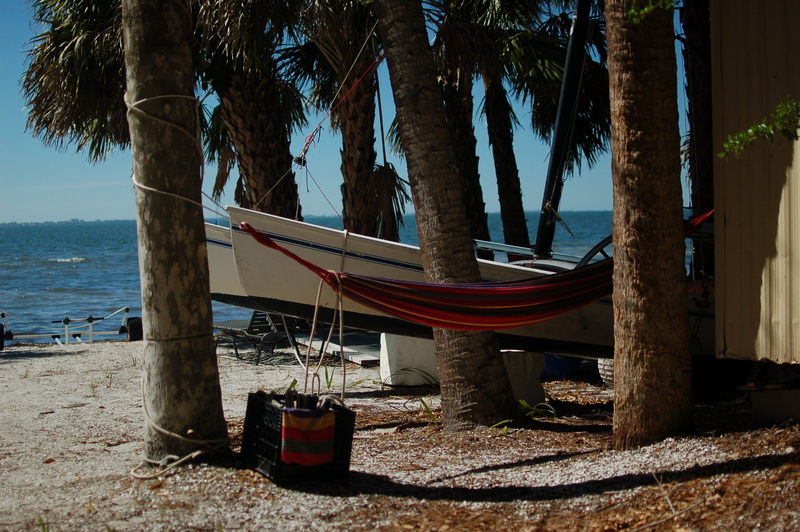 With the help of some money received through a campus student funding organization, the apiary was set up where the Pritzker Marine Research Center is now located. On a building not far from the hive, a clear window box was used to research the behavior of the honeybees. A few years later, before 2001, the hives were removed because of dwindling student interest and the opening of the Pritzker Marine Research Center. “In the early 2000s some students wanted to get the laboratory going again,” Bauer said. With the help of students who were willing to act as beekeepers, Emeritus Professor of Biology Elzie McCord, Jr. took the initiative to reopen the apiary, this time near the Caples waterfront. The hives and boxes provided students with first-hand research opportunities. Prentiss McNeill, Sarah Stamper, Ryan Keith and Lauren McGuire are some of the students who wrote theses based on research conducted through the campus apiaries. The second bee endeavor was stunted due to the inability of students to maintain the apiary over breaks from school. The hives were plagued by small hive beetles and other parasites. There was also a scare that a large portion of beehives in southwest Florida would become Africanized. Though some students focused their research on the effects of the beetles, the hives—well, all but one—were eventually removed from campus. Since its origination in the spring of 2015, the Pollinator Ecology club has been interested in re-establishing beehives on campus. Benitez was directed to Alma Johnson, the Owner and Head Beekeeper at the Sarasota Honey Company. Benitez and two other students, Sydney Clingo and Kevin Howlett, worked on the project under the sponsor of Assistant Professor of Biology and Environmental Studies Emily Saarinen. One of the most important aspects of the project was to form a plan. “She really wanted us to look at the history of bees on campus and try to figure out why it didn’t work in the past and then create a plan for why it could work in the future,” Benitez said. Physical Plant staff have worked directly with Benitez in order to provide a well-planned area for the apiary to thrive. “Ever since my first day here students were like ‘Oh, you’re an entomologist and an alum, Dr. Saarinen, we want bees’ and I was like ‘Cool, what’s your plan?’ and then it’s ‘Don’t tell me what to do!’ and I was like ‘No, I just don’t want to kill a hundred thousand bees,’” Dr. Saarinen said with a laugh. Benitez reached out to the Physical Plant to help bring the project to fruition. With the help of Director of Physical Plant Alan Burr and Coordinator of Construction Projects John Milton, a plan was formed. “We drafted multiple proposals and our proposal was basically to participate in a Host-A-Hive program because we found out that past projects didn’t work because students lost interest and because there was no professional taking care of the hives, at least long-term,” Benitez said. “You can’t assume that I am going to be here to take care of the bees and so that’s why Lili’s plan with Alma is perfect and I will throw every resource I have to make it happen,” Dr. Saarinen said. To be a part of the Host-A-Hive program, the host individuals must sign a contract. The contract states that there must be a fence around the hives. 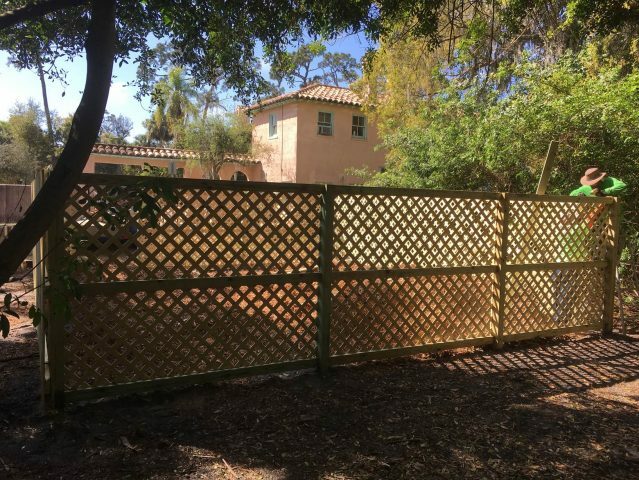 Part of Benitez’s proposal called for the construction of a fence that would be funded by the Green Fee. 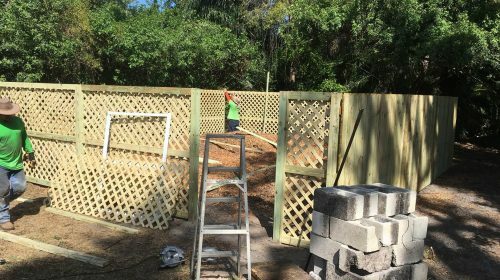 The fence has been built near the Old Caples Carriage House in a space that was originally filled with Brazilian pepper, the most widespread of Florida’s non-native invasive plant species. However, like most large endeavors, there were some bumps in the road. One of the hives from the second wave of beekeeping under Professor McCord was found during the planning stages. “And ironically no small hive beetle, which people were freaked out about,” Dr. Saarinen added. The hives are projected to officially be placed on campus at the end of March or beginning of April. Interested students can look out for a hive painting event at the end of March. The apiary is located by the Old Caples building, which will encourage the bees to pollinate the food forest. New College’s partnership with the Sarasota Honey Company provides support beyond bees and hives. The company differs from other apiary companies in that it is both environmentally and socially responsible. The Sarasota Honey Company is committed to the disabilities community: the honey is harvested, bottled and labeled by people with special needs who are compensated for their work. Beyond beekeeping, the company provides free independent living and employment training to transitioning youth with special needs. The company also sponsors their special needs beekeepers by completely covering tuition to the University of Florida’s Bee College. Owner and Head Beekeeper Alma Johnson’s commitment to the disabilities community is deeply personal. “My mother was a disabilities rights activist back in the ‘80s and I was diagnosed as a child as ‘mentally retarded’ and she told me ‘as long as you know who you are, you’re going to go into these meetings and hear some really bad things about yourself, but it’s up to you to prove everybody wrong, to get the accomodations and the resources that you need,” Johnson said. Before beekeeping, Johnson traveled with Cirque du Soleil. After traveling with the circus, she started a free day program offering transitioning services to those with special needs. She also worked with transitioning high school students in a program funded by a grant from the Department of Education. Not long after, Johnson faced challenge after challenge—she was diagnosed with cerebral cancer, her program lost funding and her grandfather was diagnosed with Alzheimer’s. “My way of gaining control of a situation that I had no control over was to continue my services to people with special needs out of my home for free because I strongly feel like the best remedy for depression or pity parties, if you want to call them that, is to serve other people and to get involved with the community; to help someone else and see other people be happy, and in the end you’ll be happy too” Johnson said. Johnson started studying organics and local food and ended up growing a “victory garden,” inspired by her grandmother, who grew these kinds of gardens during World War II. The hand-pollination was not very effective, so Johnson looked into getting bees. “It was a male-dominated profession, or even a hobby for that matter, because at the time I was a hobbyist,” Johnson said. “So that prompted me to learn more and since I was still teaching special needs kids in my home, those young adults slowly became beekeepers as well. That kind of reduction prompted Johnson to push forward, to learn independently and to go about beekeeping in a different, forward-thinking way. She applied to different university internship programs and worked for other beekeepers for free. Through it all, the Sarasota Honey Company was born, with three important mission values: to increase mentorship and employ people of all special abilities, to support programs and events that provide life skills and promote inclusion, self determination and self advocacy and to continue to provide free independent living and employment training beyond beekeeping to transitioning youth with special needs. ​ As responsible members of our community, the Sarasota Honey Company pledges a portion of the proceeds from our Host-a-Hive program to benefit local people with disabilities in the Sarasota/Manatee areas. By opting in to the Host-A-Hive program and by forging relationships with Johnson and her team, New College students are supporting pollination, honeybee research and the values and mission of the Sarasota Honey Company.